Tribest Personal Blender model PB-100 - For blending on the road or at home! Tribest's Personal Blender makes food easier to eat, easier to prepare, and easier to clean up. In less than a minute you can prepare smoothies, blended soups, salsa, pates, baby food and more. In the privacy of your home, traveling, or at the office-- the Personal Blender is portable and powerful enough to blend whole foods into delicious meals in seconds. Powerful ice-crushing, smoothie-making, go-anywhere portability with make-serve-n-store container. As versatile as it is portable, the Personal Blender delivers and impressive 200 watts of ice-crushing, smoothie-making power wherever you plug it in. Compact and smartly designed with a clear and high impact polycarbonate container for blending and serving that closes tight with a lid for easy storage. In under a minute, enjoy anywhere hundreds of the nutritious and delicious recipes. Efficient all-in-one container for blending, serving and storage. Lightweight. compact and portable. Stays at home or goes to work, on the road or on vacation- use anywhere with a plug. 200 watt motor easily crushes ice cubes to make hundreds of delicious and nutritious recipes for people on the go. Health food made easy. Quickly and easily turns whole, fresh foods into smooth-swallowing, no-chewing necessary foods for babies. Comes complete with operation guide for easy use / easy clean and 40 easy-to-follow recipes for delicious Soups, Sauces, Salsa, Dips, Porridges, Pestos, Puddings and Baby foods! Capable of 2 function modes: One touch short pulsation or press down for continuous operation. Add on options include Grinding Blade with 2 grinding space containers. 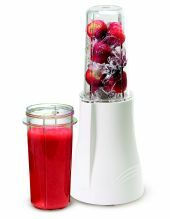 What's the difference between the two Personal Blender models PB-150 and PB-250? We love the Personal Blender. We have used it when traveling to make smoothies and salad dressings. With the convenient lids, we made a fresh, raw salad dressing and "put a lid on it". We then took it into the restaurant and poured it over our salad while remaining inconspicuous. The Personal Blender gives you full-strength blending and grinding power in an ultra-compact package, allowing you to quickly prepare numerous foods in your kitchen or on the road. Simple to use and easy to clean up. Very portable: It weighs less than 3 pounds! Efficient and quick food preparation; recipes can be completed in less than one minute from start to finish. Simply put food in, blend, eat, and enjoy. Convenient to use anywhere you go: at home, work, or even on vacation. Extraordinarily versatile so you can prepare many delicious recipes: everything from smoothies to soups, pesto to puddings, and more, all in less than 30 seconds. Grind or blend continuously or in pulse mode. Powerful: the 200-watt motor lets you blend and grind with ease. Helpful for healthy food preparation. You can use whole, fresh foods to make a wide variety easy-to-swallow, no-chewing-necessary dishes. Quick and easy baby food preparation from fresh and wholesome foods to nourish and feed growing children. 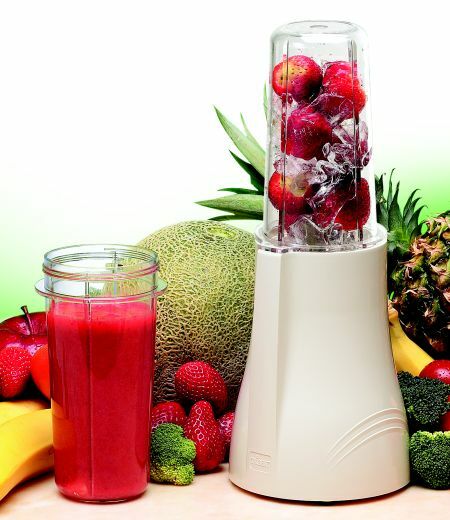 Fresh and healthy food blended in seconds, easy to use, easy to clean! Use the Personal Blender at home, work or while traveling. Includes: Motor Base, 2 blending containers, 2 Blending container lids, 1 four prong blending blade and instruction/recipe booklet. Need further information about this product? Click here to view the manual for this blender..